I don't have anything to say, I'm just updating to tell you i'm still alive. I'm still working on 2600tris. I got optional music plus some other things I changed. Look at it here. Sorry I haven't been updating the site like I normally should. I have been working on Tetris 2600 and have decided to rename it 2600tris. The link down on 11/12/09 still works to get the latest updates, though. I'm back working on it. Find the latest version here. I went back to working on GoSub for the Virtual Boy. I'm working on T&P2. Happy Columbus Day! GeoCities is closing on October 26, and since nobody really has told me whether Yahoo! Small Business is part of GeoCities, if this website should happen to disappear around then, I will try to resurrect it ASAP with the same URL, if not a different one. If you know the answer, please e-mail me under Contact at the top there. ...And have been working on Terrance & Phillip 2. Hi kids. I'm still here with nothing now, but I may have an announcement to make soon. Or maybe not, I don't know. I haven't been updating my personal 2600 collection because I got a new computer that DIDN'T come with Adobe Acrobat Reader. For those of you keeping score, I now have 292 Atari 2600 games. I'm still alive, but nothing to show for it. 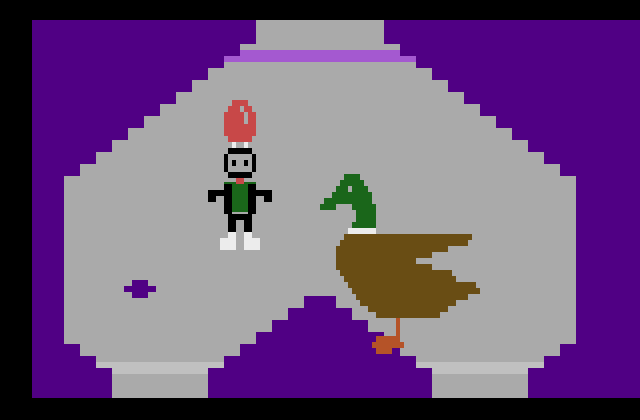 Will Nicholes has just revealed a very cool project he has been working on for the Atari 2600 called "Duck Attack". 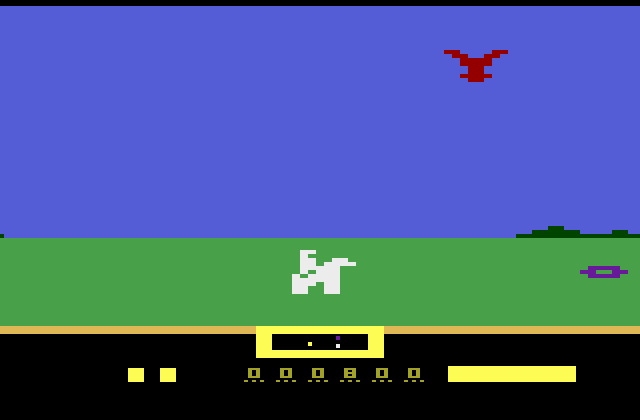 Yes, this is for the Atari 2600, one of the best games graphically speaking so far. You can check it out here at the Atari Age thread topic. Added a page of games I want. AtariAge member "jrok" is at it again, this time creating a SMB clone for the 2600 with a current title of "Mega Italian Twins," or MIT for short. You can find the latest news on it here. I'm still alive. I don't have anything new, though. Just dropped by to say I'm still here. Nothing new, though. I added an icon to the site. It's the alien's head from the alien in the Alien Greed series. 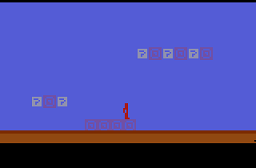 AtariAge member "jrok" is working on a new batari BASIC game called Charge! You can find out more by clicking here. I got 4 new games in the mail. The 32K games article has been updated with the release of the Mega Man Demo ROM on AtariAge. I've added a few games to my list. Happy Fourth of July! I've been working on a 2600 version of Tetris. You can view it here. Added a few games since last time. Sorry I haven't been updating. GoSub 2 is in the process of being released, but it won't be quite yet. I got 6 new games, bringing my total to 270. I've added a new article about the newest homebrewing "craze," RAM games. I'm still alive. Happy Cinco De Mayo to our Latino friends. Stacker has been released. I'm still working on GoSub for the Virtual Boy. I've updated my personal 2600 collection. And still working on Stacker. Added my MIDI of Raft Rider and Joao Buaes's MIDI of Gyruss. Added Raft Rider, Off the Wall and Lost Luggage. After spending a half-hour or so trying to get CutePDF to work, I finally did, and my personal collection list in pdf format is now up for all to see. I'm almost done, but it will probably be until Summer until it's released, anyway, that's why I'm sticking with Summer 2009 as the release date. It still needs a publisher, though. I don't have any real updates, just checking into the website saying I'm still here. JATB is being worked on again. JATB is on a one-month hiatus while I relax from working too hard on it. Work on Jack & the Beanstalk is progressing nicely.